In the city of Krakow, Poland, there lived a rich Jew by the name of Israel who was famous for his stinginess. The local beggars had long since given up trying to knock at his door. All attempts by the trustees of the community’s various charity funds to elicit at least a token contribution from him were met with polite but adamant refusals. Israel’s utter heartlessness outraged and mystified the Jews of Krakow. From the days of Abraham, charity had been the hallmark of the Jew; in 17th-century Europe, where Jews were subject to frequent confiscations of their property and expulsions from their homes, it was essential to the community’s very survival that those of means should aid their impoverished fellows. How could a Jew be so indifferent to the needs of his brothers and sisters? People started referring to the rich miser in their midst as “Israel Goy,”1 and the epithet stuck. The members of the society exchanged glances: was the old man out of his mind? They spent a few more minutes at his bedside, hoping to secure at least a modest sum for the community poor, but finally left his house in exasperation. The entire town was abuzz with this latest show of miserliness by “Israel Goy.” How low can a man sink! Even at death’s door, he’s hoarding his wealth, refusing to share his blessings with the needy. Israel’s funeral was a sorry affair. It was difficult to even scrape together the needed quorum of ten to conduct a proper Jewish burial. He was buried off to a side, on the outskirts of the cemetery. No eulogies were held, for what could be said of such a man? A few minutes later there was another knock on the door, heralding a similar request. A third petitioner followed, and then a forth and a fifth. Within the hour, no less than twenty families came to ask for the rabbi’s aid to meet their Shabbat expenses. 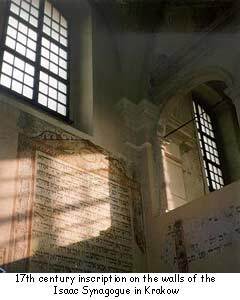 The rabbi was mystified: nothing like this had happened before in all his years in Krakow. Why this sudden plague of poverty? Rabbi Heller called an emergency meeting of the trustees of the community’s charity funds, but they could not explain the phenomenon. They, too, had been deluged with hundreds of requests for aid in the last few hours. The communal coffers had been virtually emptied! Investigation revealed that hundreds of families in Krakow had subsisted this way—up to now. For some reason, none of the grocers, fishmongers and butchers were willing to extend credit any longer to the town’s poor. Rabbi Yomtov Lipman was shattered. Such a special person had lived in their midst, and they, in their haste to judge him, had insulted him and reviled him. The rabbi announced that the shloshim (30th-day anniversary of the passing) of Israel shall be a public fast day. All adults will neither eat nor drink from morning to evening, and all will gather at the cemetery to beg forgiveness from the deceased. Goy literally means “nation”; in common Yiddish usage, the term is used to designate one “of the nations”—i.e., a non-Jew. The more I think about this, the more what he did makes sense. He allowed many, many people to regularly take part in tzedaka of high form. If he had revealed that he was responsible, it would not have been the same for any involved. As far as why he didn't give to the collectors...This puzzles me, a lot. If he thought his strategy was better than theirs (and thus wouldn't want them deciding how to use his funds), shouldn't he have (perhaps anonymously, e.g. through a letter) shared this idea with them? thankyou for sharing and thankyou G-d for the life you placed and shared in ways unseen, may all those seeking forgiveness from this tale be further blessed throughout the generations to know and see that in each of us, seen or not, is your loving kindness and a life not to be judged, but nurtured like their own. Real Israel Goy in my town.? There actually was a man in my community who had a large fortune but was known in both the Jewish and non Jewish community for his refusal to give to any charity according to his readily apparant means. He left most of his wealth to a foundation for the equal benefit of the Jewish and non Jewish community. The amount of money involved is enough to TOTALLY remake the Jewish community $100s MM, and impact the non Jewish community in untold ways. I don't think we will ever know if he was quitetly generous in life like Israel Goy, but if he was, I hope that he was able to enjoy, if not the koved, then the self understanding of anonomous giving. .Today every Jewish institution is scrambling to access his foundation. It would be nice to know that he was generous in life in his own way. Perhaps that is best left up to us to trust in the goodness of us all. Israel Goy It is a wonderful story. I cannot understand all words exactly, but in my spirit I can understand it very good.